Key to this whole light lunch labour of love -- this journey, if you will, Dermot -- is that there'll be highs (Pump St) and lows (Cafe Tempo), ups (Jimmy's Farm) and downs (Wicked Cafe), the sublime (Cook's Shed) and the ridiculous (El Taco Loco). Can you guess which part of the sine wave we're on this week? Up on Ransomes Europark and playing David to B&Q's Goliath is a Burger King, one of a handful dotted in and around Ipswich. 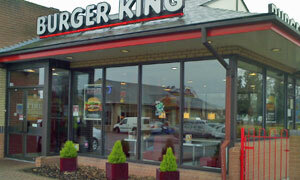 Andy, the ethical consumer, guesses that BK might be greener than McDonalds. I'd confidently told him that at least it would have free WiFi. Not the case, even though the town centre branch does. Fail, as my daughter would say. Current kids' meal toys are from Rango, by the way. Staring at the large Falling Down overhead menus presents you with that classic wedding reception choice: beef or chicken? Gotta be a Whopper meal for me. Go large? Only if I keep coming here for lunch, boom-boom! I'll have a bottle of Tropicana to offset all those empty calories. Andy wings it with his chicken tenderthingy. Bluetoothed lady grabs our ready-cooked burgers, shovels some salty fries, offers us sachets of sauce and we're off to a comfy table in the corner. Very much like Vancouver in here, all that glass and light. Concentrating on the earnest lunchtime conversation isn't helped by (a) Cheryl Cole fighting for her love on the loudspeakers, (b) Sky TV's breaking news banner of LIBYA DECLARES CEASEFIRE on the flatscreen telly and (c) snarfing down my big ol' burger and mouthfuls of tasty fries. Guilty: tick. Pleasure: ditto. Getting busier in here. I'm completely suckered by a promo dessert poster: as Oscar said, I can resist anything except pancakes and ice cream. Small waffly chunks, chocolate sauce and vanilla ice cream. We have it good. And the coffee is multilingually hot and coffee-like. Hard to argue with change from a tenner for hot meal + cold drink + dessert + hot drink. If it was a car -- GT Super-Van. If they were passing by -- Ledley King.